Nick Kyrgios has taken a swipe at Lleyton Hewitt in a deleted Instagram post, as a furore over his relationship with the Australian Davis Cup captain rages on. Kyrgios gave an unconvincing response when asked whether he still supported Hewitt, after Bernard Tomic claimed that Kyrgios and Thanasi Kokkinakis were among the Australian players who did not like the former world No.1. He added fuel to speculation of a rift, and also Tomic's claims of perceived favouritism from Hewitt, with an incendiary Instagram poll that was posted on Wednesday night and quickly deleted. 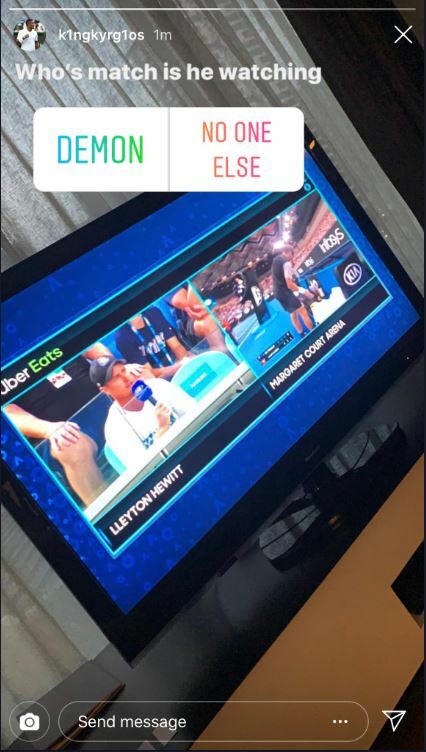 The poll featured over a screenshot of Hewitt commentating the second round match of Alex De Minaur for Channel Nine, seated in De Minaur's players box. With De Minaur one of Hewitt's supposed favourites, Kyrgios asked: "Who's (sic) match is he watching - Demon (or) no one else?" The previous night, Kyrgios was asked if he had a rift with Hewitt and said: "Not really." Tomic claimed that Hewitt had upset himself, Kyrgios and Kokkinakis with his handling of the Davis Cup team, including playing himself in doubles despite supposedly being retired. 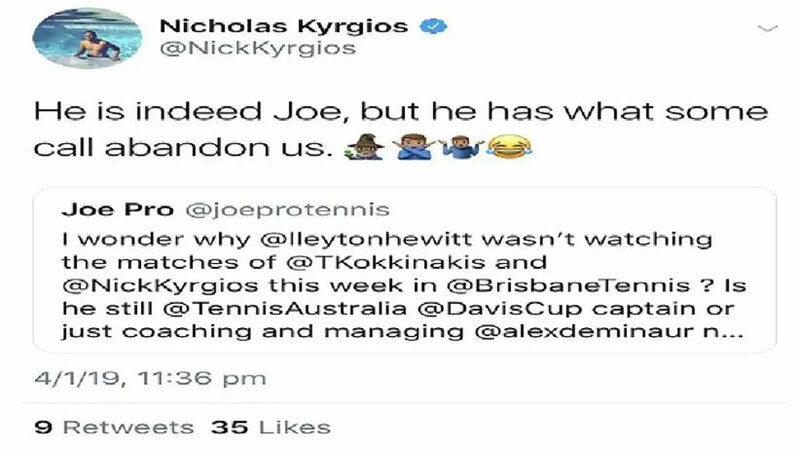 Kyrgios' fresh crack at Hewitt followed a deleted Twitter post earlier this month, which he claimed was a joke but also chipped Hewitt for "abandoning" he and Kokkinakis in favour of De Minaur. 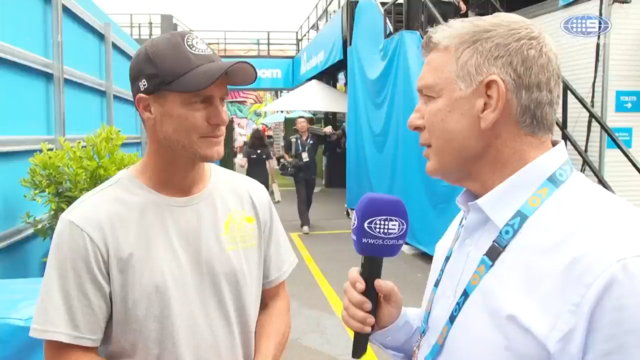 While Hewitt told Channel Nine he did not feel that there was a genuine rift between himself and Davis Cup players, the fallout during the Open has been ugly. Kyrgios said that he would still be available for Davis Cup, if selected, but has offered the barest of public support to Hewitt. Australian No.2 John Millman said he had only found Hewitt's Davis Cup captaincy positive. "I've always felt actually quite well-supported by the captain, by the coach, by the support staff," Millman said on Wednesday, adding that he'd like to see "larrikin" Tomic and "top bloke" Kyrgios remain part of the squad. "I think sometimes we go a bit hard on him when you don't see what he's doing off the court," Millman said of Kyrgios. "He has his own charity and that's more than me. "I think sometimes we forget about those things when we're just having a go at performances." Kyrgios caused another major stir on Wednesday night by taking a major crack at Hewitt's former coach Roger Rasheed and AFL legend Gerard Healy, after they discussed the fiery tennis star on the radio. "You blokes all have zero idea. It's comical people like yourself have an opinion of us. You blokes are anything but athletes, so how about you concentrate on your own s---. Zero credibility," Kyrgios said in the first of three tweets.